Get to know our staff! – U District, Lets Go! 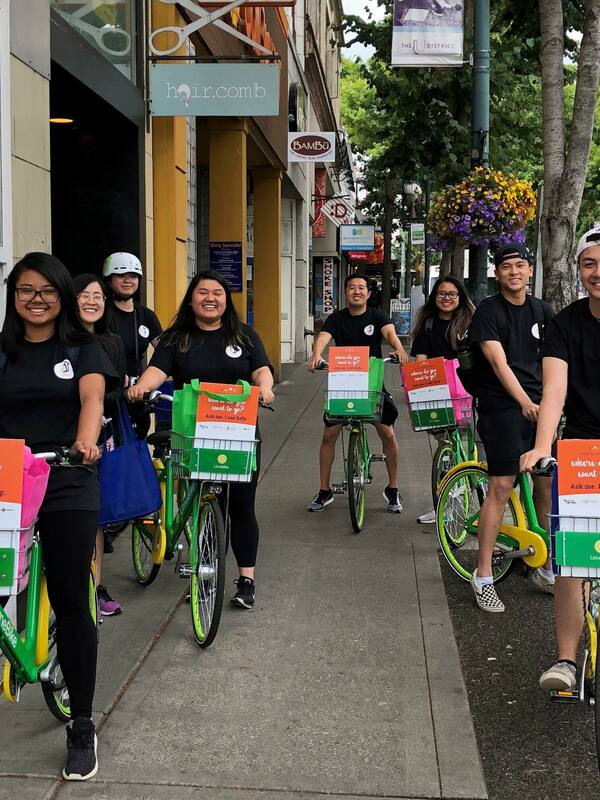 This past spring and summer we participated in several large scale events like the 49th Annual University Street Fair and Cascade Bicycle Club’s Bike Everywhere Month in May, and Transportation Choices Coalition Ride Transit Month in June. We coordinated a Transit Talk public presentation with high profile speakers at the University Book Store and we helped thousands of visitors find their way around the neighborhood through our mobile wayfinding efforts during the Special Olympics Games USA! We engaged with over 3,000 members of the public and enrolled 96 people into ORCA LIFT, Metro’s Reduced Fare Transit Pass. How did we make this happen? A handful of energetic and enthusiastic staff, that’s how! Take a moment to read about some of the individuals that helped make these past few months possible. If Brenda was a mode of transportation she would be the Link Light Rail, reliable and on time. If Jedell was a mode of transportation he would have to be a food truck because he always has food on him. Meet Phuong-An, Phuong-An is a recent University of Washington graduate. She completed her degree in sociology. She hopes to continue her education in human centered design and engineering. Eventually working as a UX designer. “I would have to say my favorite event would be the U District Street Fair. It was a great opportunity to talk to the community and had great food! If Phuong An was a mode of transportation she would be a bus. Not always on time but still reliable. If Emily was a mode of transportation, she would be a car because they’re cool. If Ellie was a mode of transportation she would be a motorcycle because they’re fast and lane splitting can be fast when done safely and legally. Thanks for getting to know us! Next time we’re out in the community, stop by and say hello! Want to find a great commute? Check out our free commute planning services.